These cookies are tasty and colorful and full of flavor from the fruit and nuts. 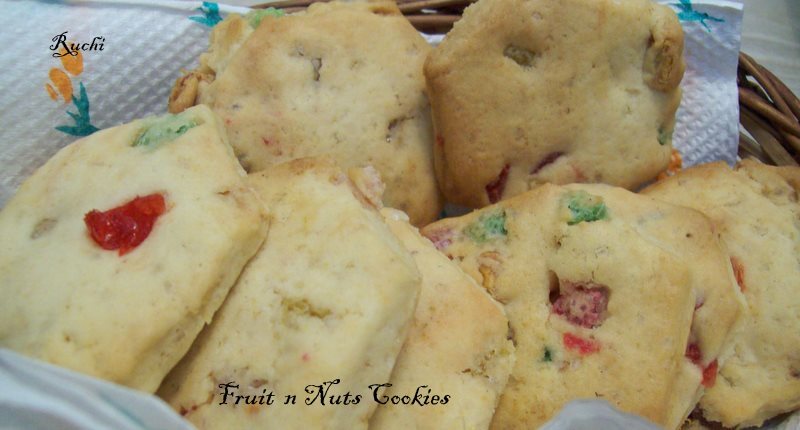 Fruit n nuts Cookies are a real treat for their luscious taste and spellbinding aroma and perfect choice for the holiday season. These soft, colorful cookies are a nice addition to a Christmas dessert tray. 1. In a mixing bowl add powdered sugar and butter. Cream butter and sugar until light and fluffy - Add maida, tutti frutti , dried fruit and nuts and mix well. 3. Divide the dough in half and place each half and Wrap it with butter paper Roll each log in the butter paper and Put it up in the freezer to make the dough firm for 30 to 40 min. 4.Cut log into slices or cut it with a cookie cutter and Bake it at 180 deg C for 10 to 12 minutes or until the edges are slightly golden brown. Transfer carefully in a rack and cool it.Store in airtight container. Scrumptious and super cute looking cookeis. These cookies will make a fabulous treat! These look delightful!= & adorable! !